This blog post is also available as a guest article at Atlassian's Confluence Blog. 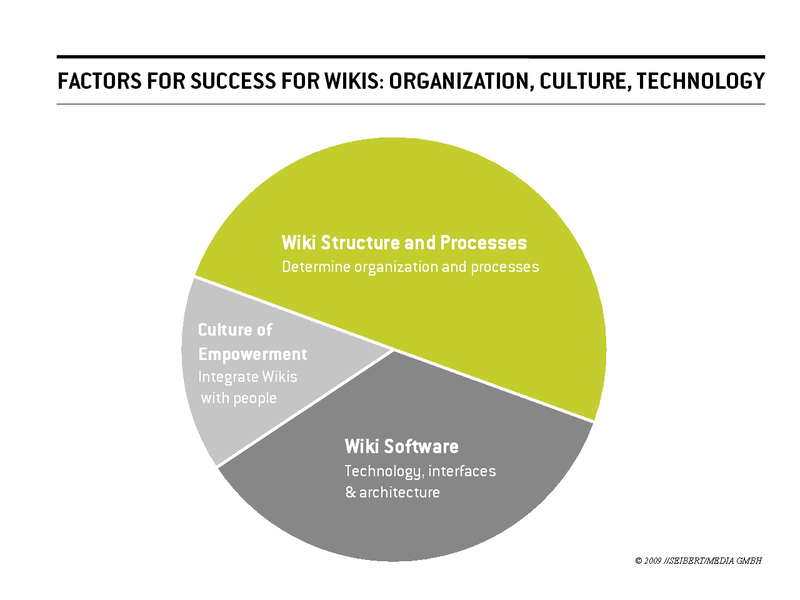 From dozens of enterprise Wiki projects, we know that the successful introduction of a Wiki into a company typically depends on three factors: technology; organization; and culture. In the first of these three articles we focused on the requirements of technology. This report will now focus on the organizational factors for a promising Wiki project. In our experience the organizational component is up to 50% responsible for the success of a Wiki introduction. It is not typically the technological components that create difficulties. Companies that use Wikis encounter almost exclusively organizational problems, problems that hinder the establishing of the Wiki, as is argued convincingly by Henriksson, Mikkonen and Vadén in their study “Experiences of Wiki use in Finnish companies" (Tampere 2008). According to such experiences, companies often complain that too few employees upload information to the Wiki actively or often, that the Wiki participants do not grasp the use of the Wiki quickly enough, and that it is difficult to motivate participants to use the Wiki. The organizational measures that your company takes within the context of the Wiki introduction must therefore be complete as well as with an eye on the long-term. The first element of the organizational components is the posing of the question regarding which tasks should be accomplished by the Wiki, in other words, the question about the goals of the Wiki: Why is a Wiki being introduced? Which tasks should the employees perform with the Wiki? Here, certain use cases as well as the concrete use of the Wiki in these use cases must be defined well in advance. From the very beginning, you need to choose a relatively narrow definition for the orientation of the Wiki regarding the use cases. At the same time, it would be ideal to maintain the overall perspective. “Think Big, Start Small, Act Now” is the sensible recommendation, heard quite often due to the influence of Phyllis Piotrow (Piotrow, Phyllis: Keynote Conversation "Strategic Partnerships“, Entertainment-Education Conference, USA 2000). A second element among the organizational components is the so-called “strong backing from the top”: Missing participation from the management level is connected to a high risk, as without the support “from the top”, it will be difficult for a software tool to achieve wider acceptance. Again and again, Wikis become successful within individual departments, yet without the support of the management, it is very unlikely that a company-wide rollout is possible. It is important that the introduction of the Wiki has the complete support of the management and that the management makes available the necessary resources and financial means. The third element includes the responsibility for the Wiki and the necessary time resources to work with the Wiki. On the one hand, it is important that someone takes over the responsibility for the Wiki and actively pushes its introduction. The small team around this person occupies itself with content integration, fulfills the classic functions known as Wiki-gardening, installs new plugins, solves especially intransigent use cases, provides support, etc. Wiki specialists speak here of a so-called Wiki Evangelist; the team is known as Wiki Champions. These provide, especially in the instruction phase, valuable support: In the framework of the Wiki pilot project (typical during the introduction), this team supervises a larger group of employees who are working with the Wiki and later assumes more responsibility. Many companies underestimate the incidental resources and necessarily high level of time expenditure that is required for performing these tasks. The difference between the Wiki Champion and the regular member of a project team is as follows: The Wiki Champion invests considerably more time in the Wiki and expends considerably more time in performing tasks within the Wiki as well as in offering first-level support. The Wiki pilot project is the term for the phase during which a number of company employees (often in concert with an experienced Wiki specialist) begin the structuring and establishing of the initial content. The most important aspect of this phase is to inject as much relevant content as possible into the Wiki to make it interesting and attractive for employees. Regarding this phase Stewart Mader argues that not only the so-called “early adopters” (employees known for their openness to new work methods and technologies) should be included; rather, users with less affinity for technology and who are generally more skeptical should also be included so that the employees working in the Wiki pilot project build an accurate, representative microcosm of the company. The most important goal for the Wiki pilot should not be thought of as the complete translation of the company knowledge base into this new digital information system. For one thing, this would take far too much time and effort. In addition, tasking a few employees to digitize and prepare the knowledge of all the employees is a task that would be nearly impossible to execute. The goal of the Wiki pilot project should instead be about establishing exemplary and successful examples for using the Wiki. If the Wiki pilot is successful, this will be passed on via word of mouth: The examples of best practices that were developed will be talked about throughout the company, during which time the participants in the Wiki pilot will play important roles as go-betweens and communicators. This word of mouth “propaganda” lays the cornerstone for the establishing of additional, albeit smaller, pilot projects within individual company departments or areas. But here, too, the goal is still the implementation of best practices, specific to the individual areas; these will show everyone involved just how valuable a Wiki can be for their daily work. In this regard, it should not be about forcing the system onto all possible departments with the greatest possible speed; rather, it is about ensuring that more and more employees become enthusiastic about the idea of the Wiki, thus finding the right path to using the Wiki. In order to increase employee activity during the rollout phase, it is absolutely necessary to make the Wiki known, to communicate throughout the company that there is a Wiki and that it should be utilized for certain use cases. Our experience with projects has shown that companies cannot afford to believe that this alone is enough: It is also usually necessary to repeat such messages and to remind employees repeatedly about this new tool. This is a job for Wiki marketing. In the realm of Wiki marketing there are various instruments that have proven themselves effective, for example, pens bearing inscriptions such as “I’ll put it in the Wiki: www.wiki-name.com“, various office supplies and displays with information about the Wiki, a feature on the Wiki in internal newsletters, especially active Wiki participation on the part of management or other company leaders in order to demonstrate the importance of the system, and many more. It is not important, however, how many measures you take, but rather much more important that the Wiki marketing is both unceasing and ongoing; it should be implemented over a longer period of time in order to sensitize the employees to the Wiki as well as to the value placed on it by the company. During this phase the company should also identify those employees who are most open to the Wiki and then help them establish best practices for their individual needs. If the Wiki shows itself to be useful in the context of their daily business processes, the chances of establishing it as a successful knowledge management system are significantly higher. To activate its employees, the company leadership is set the task of offering them both training sessions and information on how the Wiki should be used: The employees need to become familiar with the user interface as well as with the individual functions of the Wiki. To accomplish this, the company has several options. Several have shown themselves to be useful in practice. For example, the company could post (semi-) permanent information to the Wiki, which requires the employees to locate and retrieve such information on their own; such information could include operating manuals, screencasts, and videos in the Wiki or on the Internet that demonstrate the use of the Wiki. Another excellent set of options is that of training sessions offered by third parties or the in-house Wiki evangelist, during which employees are acquainted in a “hands-on” manner to certain functions. The fundamental goal is that the employees can work with the Wiki just as naturally and assuredly as they do with, for example, e-mail. The users’ individual abilities and expectations naturally play an important role: In our experience, there are employees who quickly acquaint themselves with and teach themselves how to use the Wiki, learn the software by using it, and after a short period of time already have the feeling that they can work with the software. Some employees, on the other hand, need personal contact with experienced Wiki users and quite possibly a permanent contact person who offers first level support (in other words, first aid on the telephone and through conversations). It is always important to ensure that every employee has various measures available and can take up those offers that will best help him or her become familiar with and learn how to use the Wiki. When the Wiki is being rolled out to increasing numbers of employees, numerous use cases have proven themselves valuable in practice, as they considerably improve the work as well as positively affect the organizational structure and company development. We recommend that as soon as innovative ways are found to, for example, replace e-mail and paper documents with a controlled and transparent Wiki process, that obsolete, suboptimal working methods should be increasingly removed from the daily business. If such cases are identified, then they should be formulated into directives that require the use of the Wiki in those use cases. These binding directives should be accompanied as well by content information, reasons, and discourse. In fact, there are often practical and good reasons for the retaining of certain current practices, for holding on to the status quo. These must be examined, analyzed, and dealt with. A further idea in this context is the development of binding communications examples within the company, in other words, of use cases, in which it needs to be clearly defined which information should be put in the Wiki and which processes should be depicted using other communications tools: When do you use the Wiki? When do you send an e-mail? When do you work with a document management system? Especially for critical cases that could be depicted not only in the Wiki but also with the help of other already extant systems. Clear rules need to be defined regarding when which system should be used, taking into account the framework of the organizational considerations. From an organizational perspective, it is just as important that the Wiki has a professional layout and is not implemented using the standard, “out of the box” version. The company demands from its employees that they store their most valuable capital – their knowledge – in the Wiki as well as make this knowledge centrally available to other employees. With this in mind, it is of great importance that a corresponding environment in the form of a qualitatively valuable solution be created, an environment within which the employees are happy to act. Employees are much more likely to identify with such a system, one that seems trustworthy and integrated, than one that seems to irritate the company Intranet like a foreign substance. In addition to this, the Wiki layout is an important organizational component, because a high-value solution is politically symbolic within the company: The company leadership is underlining the meaning of the Wiki by investing in a layout incorporating its corporate design, thus signaling that the leadership believes in the system and views it as a central, and centrally important, platform.